Ade Collins and Shorttrack UK are delighted that Honda are behind the sport for the 2010 season! Adain Collins, runner-up in last year’s Shorttrack UK series, will be racing a 2010 Honda CRF450 with the backing of HM Plant Honda. 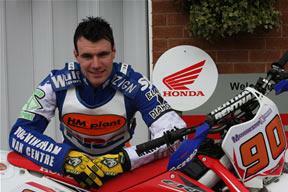 HM Plant honda team boss Neil Tuxworth said: "We are looking forward to a great season helping Adain.